If you are looking for a book with useful advice for preventing, recognizing and treating many common saltwater diseases then check out "The Marine Fish Health & Feeding Handbook: The Essential Guide to Keeping Saltwater Species Alive and Thriving" The authors Bob Goemans and Lance Ichinotsuboare are life long hobbyist. Lance is sill actively servicing high end aquariums for his clients as well as has a retail aquarium store in Pompano Beach, Florida. This book is written in plain easy to understand text and goes deep into the benefits of a healthy aquarium, good nutrition and its relationship to fish diseases. It has many color photos showing what diseases look like on a fish. Hopefully you will not have to battle fish diseases but if you do this book is a great resource. 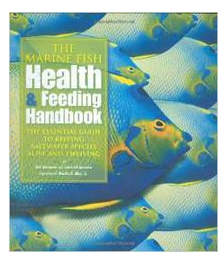 For more information on "The Marine Fish Health & Feeding Handbook" Click Here.